In continuation to the commitment of expanding medical education in the critical area of Hepatology, Ferozsons supported a landmark series of certificate courses on liver diseases to over 250 physicians across Pakistan. 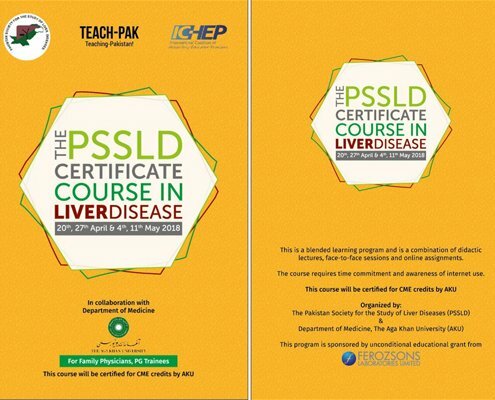 This certificate course on liver diseases was conducted by Pakistan Society of the Study of Liver Diseases (PSSLD) in association with the International Coalition of Hepatology Education Providers (IC-HEP) and the Department of Medicine, Agha Khan University Hospital (AKUH). This course certified for CME credit hours by AKUH combined didactic lectures, face-to-face sessions and assignments given to the participants. There were 4 sessions of the program held on April 20, April 27, May 4 and May 11 simultaneously in all 6 cities (Karachi, Hyderabad, Multan, Faisalabad, Lahore and Rawalpindi) that were connected at the same time. These webinar based programs in partnership with PSSLD, IC-HEP and AKUH promise to expand the learning for Family physicians and Postgraduate trainees to help tackle the challenge of liver diseases such as Hepatitis and others in the country.